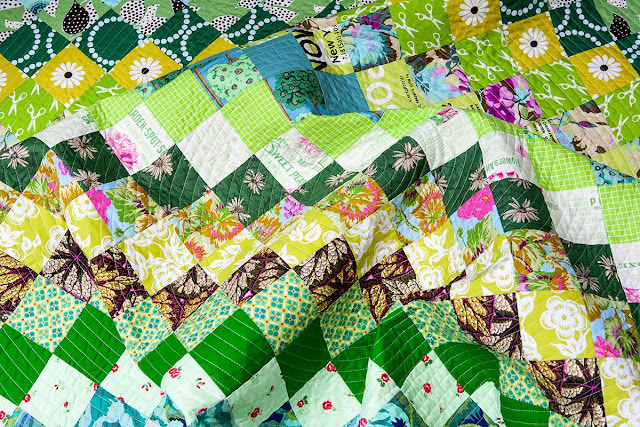 A finished quilt.... at last. That did take a while indeed but I am truly happy with the result. So prepare for lots and lots of pictures. 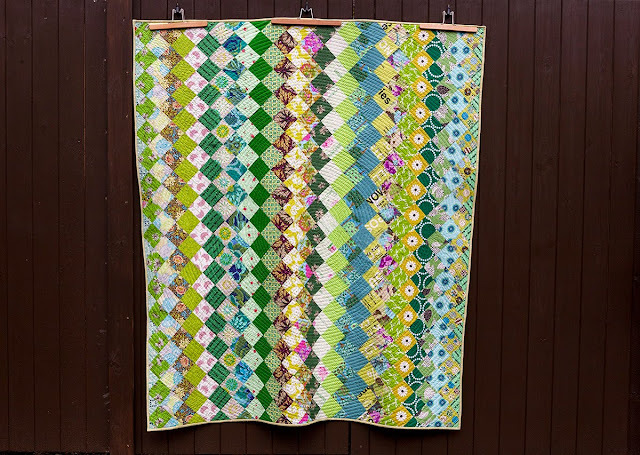 My original inspiration for this quilt were Spring greens and it is kinda apt that I have finished it when we are once again moving into Spring. For all those in London, the quilt is on show at the Village Haberdashery from tomorrow onwards for a while. 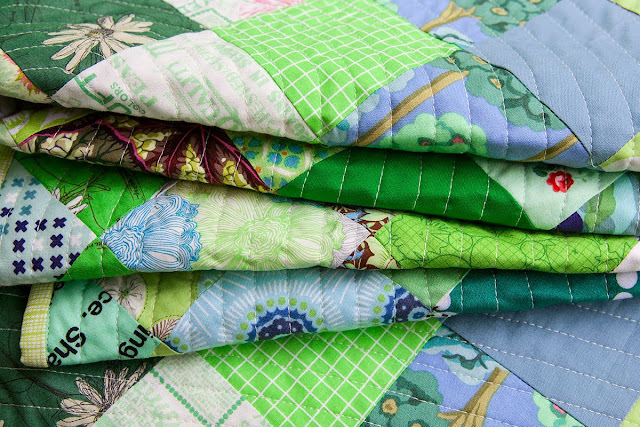 The quilt has about 30 different fabrics in various shades of green cut into simple squares and arranged on point in a uniform way. 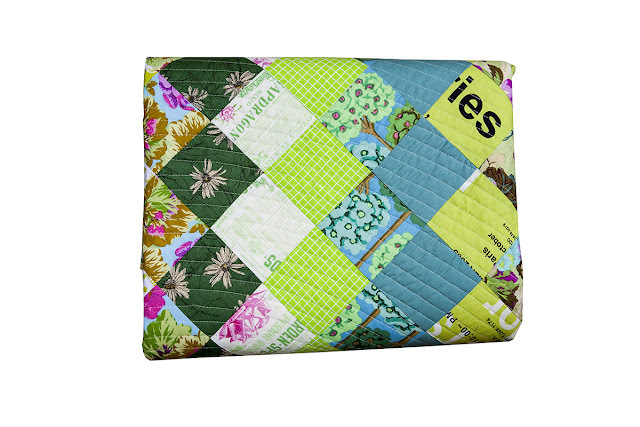 I love that it is riutuos in its colouring but still ordered and organised. I had some pretty fabric in my stash that lend itself to fussy cutting and these little flowers create a real focal point in the quilt. 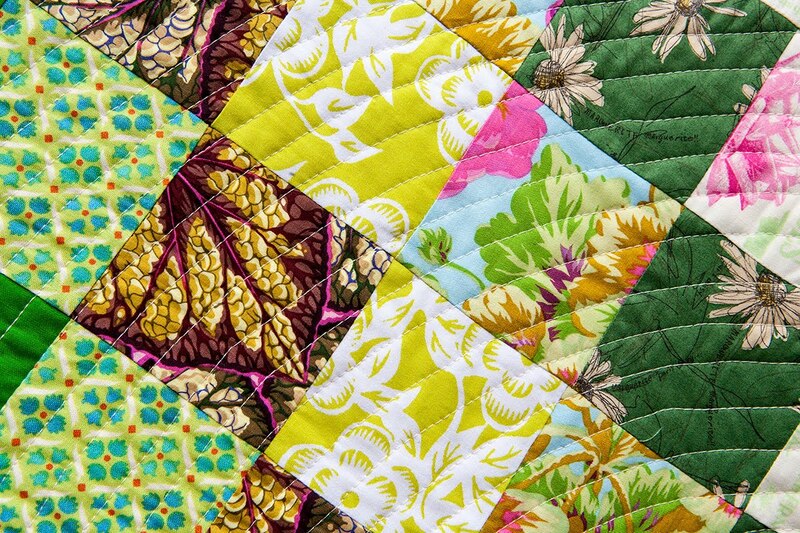 To combat all the vertical and diagonal lines I decided to quilt in a concentric circle that I so love and I think this worked out really well. 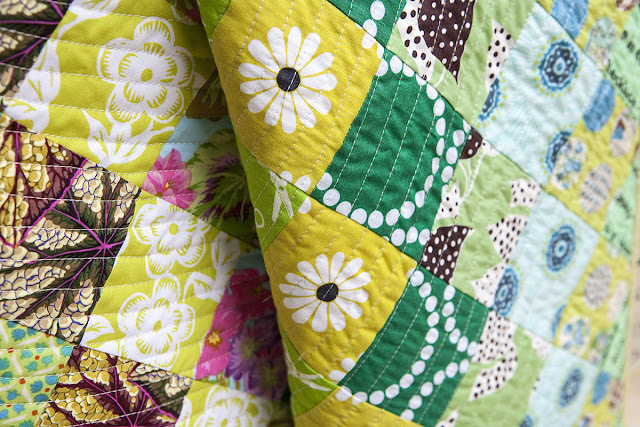 Quilted circles always get me! It has been quilted densely with barely a half inch between the lines which gives the quilt its typical texture. 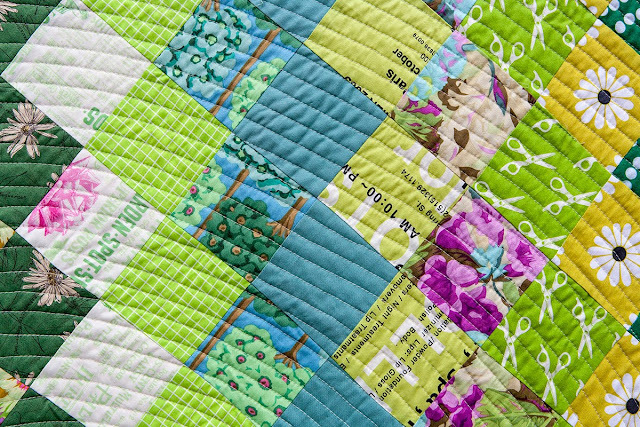 I used an off-white Aurifil 40w thread for the quilting rather than a 32w given the quilt is quite densely quilted. But either would have been fine. It's just what I had a hand to be honest. 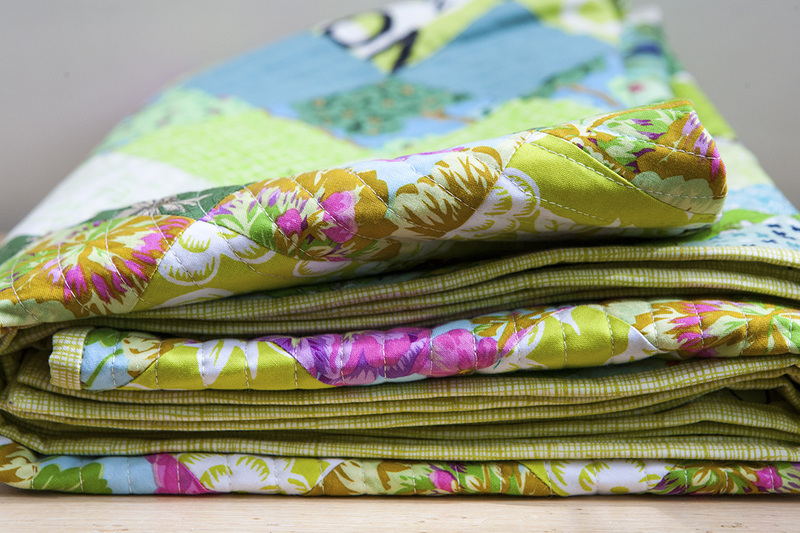 Generally I prefer to quilt with a thicker thread and never quilt with a 50w for example. Though I use 50w or 60w for piecing. The quilt is 70in x 60in and thus big enough for a good cuddle on the sofa or a double bed indeed. 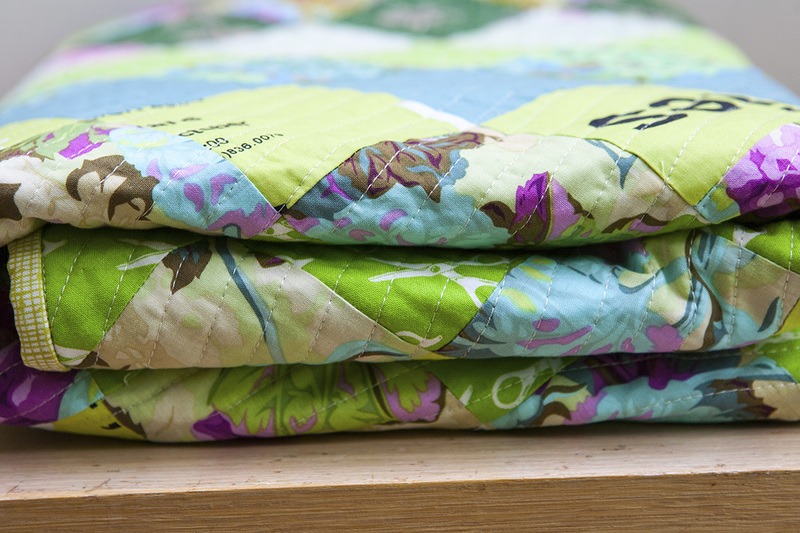 I prefer my bed quilts not to be the entire length of the bed but to just cover 3/4 of it. 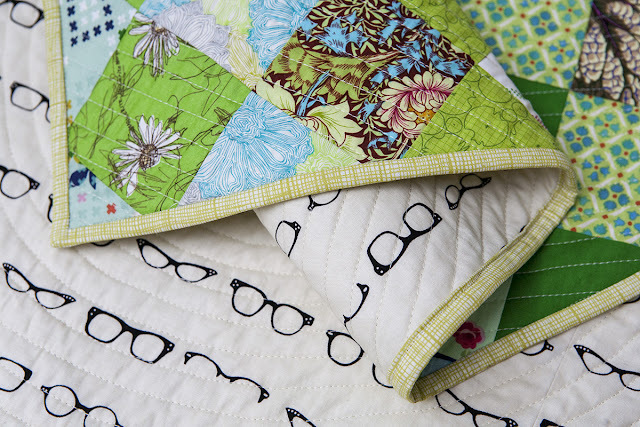 The back fabric is a gorgeous and fun print by Riley Blake and I have the same glasses pattern in a deep yellow in stash too for another exciting quilt. I so enjoyed playing with those greens (and the occasional pink popping up) that I am actually thinking of making 3 more seasonal quilts in this way, one in yellows for the Summer, one in deep reds for the Autumn and one in white/greys for the Winter. The quilt will also be listed in my Etsy shops in a few days time.